American engineer John DeLorean was arrested by the FBI for conspiring to smuggle $24 million worth of cocaine into the US while the DeLorean Motor Company was failing to raise money to survive. Claiming he was coerced into participation in the deal by FBI agents who approached him as legitimate investors, he was acquitted. 2. In 2011, Nicolas Cage woke up in his Orange County house in the middle of the night to find a naked man, wearing Cage’s leather jacket and eating a Fudgesicle in front of his bed. The man was arrested by police, but Cage didn’t press charges. 3. Hitler's doctor, Theodor Morell, kept a medical diary of the drugs and other substances, he administered to the Führer on a daily basis, such as Atropine, Caffeine, Cocaine, Adrenaline, E. coli, Methamphetamine, Strychnine, Morphine, Heroin, and Testosterone. 4. Carl McCunn was a wildlife photographer who flew to remote Alaskan wilderness but forgot to schedule a pickup aircraft. In his diary, he wrote of a plane that spotted him stranded and in excitement he accidentally gave the pilot an "All is well" signal. His diary was found with his body. 5. The lyrics "Let me stand next to your fire" came from when Jimi Hendrix was at Noel Redding's mother's house, and Jimi asked Noel's mother if he could "stand next to her fire" to warm up. The family dog was laying by the fire which inspired the line, "Move over Rover, and let Jimi take over." 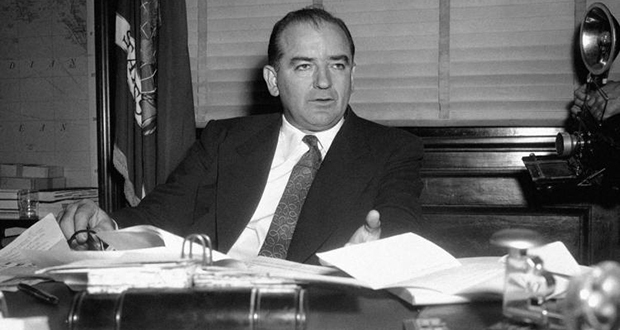 Senator Joe McCarthy was a heroin addict in his later years, and the US government paid for his heroin. 7. The East German secret police (Stasi) preferred not to arrest people, but rather use "biodegradation" to paralyze enemies of the state by organizing failures at their workplace, destroying their friendships, and ruining their reputation. 8. In the early 1900s, a woman named Dolly Kroschel kept a secret lover in her attic for years, had the lover kill her husband after a fight, continued keeping the lover in her attic, and was charged with murder 8 years later but was set free because there was a 7-year statute of limitations on murders at the time. 9. Pet food tasters (humans) serve as the professional quality control for pet food. They make up to $120,000 per year. 10. Not only are Gentoo penguins fiercely monogamous, they will violently banish any "cheaters" from their colonies. Chrisopher Lee was a special forces commando, and corrected Peter Jackson on the actual sound one makes when being stabbed in the back. 12. A single lightning strike killed 323 reindeers in Norway in 2016 because they were clustered together and the electric current was able to travel through the ground and up the animals' legs. 13. There has not been a single occurrence of a wild killer whale (orca) killing a human. 14. In 1959, Colonel William Rankin became the only known person to survive a fall through a cumulonimbus thunderstorm cloud and suffered from frostbite, welts, bruises, and severe decompression as a result of the 40-minute fall. 15. There are large shipwrecks buried deep under the cornfields of Kansas City, Missouri. Pepsi was originally called "Brad's Drink." 17. The Talmud (Jewish book of Rabbinical debate) is a best seller in South Korea. South Koreans endorse the stereotype of Jews being successful in education and business so they started studying the Talmud as a means of acquiring Jewish success. 18. In 1981, archaeologists discovered a medieval knight's body which still had liquid blood, intact organs and visible irises. 19. Olivia de Havilland, an actress who starred in Gone With The Wind dated Howard Hughes. She is still alive at the age of 101. 20. Compersion is the secondhand rush of happiness you feel when seeing somebody else do well. The human eye is different from most animals in that we have a large sclera, the white part of the eye. It's theorized that we evolved this feature so that we could silently communicate where we are looking. 22. The "Tree That Owns Itself" is a white oak tree in Athens, Georgia, that has legal ownership of itself and of all land within eight feet (2.4 m) of its base. 23. The Australian funnel-web spider's venom is extremely toxic to primates but mostly harmless to many other animals. There are no primates in Australia, apart from humans. 24. The number of days Phil (Bill Murray's character) repeated Groundhog Day in the movie was 38, but in actual time it was calculated to be 8 years, 8 months and 16 days. 25. By the mid-70's, disco and the Bee Gees were both declining in popularity. "Stayin' Alive" helped both stay alive. The fact about shipwrecks below the cornfieldS is inaccurate- kansas city in this case refers to kansas city, Missouri, which makes sense because Kansas itself does not have water transportation historically. Thank you for pointing it out. We have changed the fact to reflect that it was Kansas City in Missouri and not Kansas.